In Wisconsin, you’re free to think bigger, encouraged to make your mark, and poised for great things to happen. Our culture and traditions fuel discovery and create opportunities for personal and professional fulfillment. Join us in strengthening and sharing what it means to live and work in Wisconsin. What's behind Think-Make-Happen In Wisconsin? Increasingly, economic opportunity is being driven more by the availability of talent than it is by traditional economic development infrastructure—tax climate, transportation networks, etc. To maintain its competitive edge with respect to retaining and attracting the best and brightest minds to fill existing and future jobs, Wisconsin must expand perceptions regarding the career and personal fulfillment opportunities our state offers. Throughout our history, we’ve shown that if you THINK big and strive to MAKE your mark, anything can HAPPEN in Wisconsin. From our nationally recognized education system and our renowned work ethic to innovative thinking that fuels ground-breaking discoveries, our culture and traditions create opportunities for personal and professional fulfillment. To further guide our approach, we conducted a national survey of business leaders, investors and people representing the general population. Among the insights this study uncovered is the fact that Wisconsin is a state well-known for its thinkers, makers and doers. You can download a summary of our research findings here. The Wisconsin Economic Development Corporation (WEDC) has engaged businesses, educational leaders, economic development partners and young professional groups throughout the state to help formulate and execute a coordinated strategy to communicate the value Wisconsin delivers to the people and businesses that call it home. Join the conversation on social media using hashtag #ThinkMakeHappen. Share your story and what you love about Wisconsin. Check out our library of Wisconsin Stories and Wisconsin alumni testimonials and share them through your social media networks. Just for Wisconsin alumni: Click here to tell your story and share what you love about Wisconsin. Employers are encouraged to use the Think-Make-Happen video in their employee recruitment efforts. The video promotes opportunities in Wisconsin and why the state is a great place to live and work. If you would like to adopt Think-Make-Happen In Wisconsin® messaging to help promote business and talent initiatives in your area, please contact us. Where can I find Think-Make-Happen on social media? Find Think-Make-Happen on these social channels and join the conversation using #ThinkMakeHappen. Companies, communities, school districts and economic development organizations are already integrating Think-Make-Happen In Wisconsin into their talent retention and recruitment efforts. Learn how Think-Make-Happen can support your marketing initiatives. Wherever you go in Wisconsin, you’ll find communities dedicated to what’s next. Communities with independent voices and unique opportunities. Fox Cities is incorporating Think-Make-Happen In Wisconsin into their marketing efforts, to let the best and brightest know that they have a place in Wisconsin. Finding a place to Think-Make-Happen is essential to a young professional. In 2017, NEWaukee incorporated Think-Make-Happen In Wisconsin into their largest YPWeek event yet, which had 25 communities participating across the state. An annual event, YPWeek taps the passion Wisconsin’s young professionals bring to the workplace to build and sustain Wisconsin’s strong workforce and high quality of life. From careers and commute times, to relaxation, motivation and education, the perfect balance is what everyone’s after. Wisconsin has it, and we want to let everyone in on it. That’s why we’re developing an online resource that highlights everything that’s great about each region in Wisconsin. So while employers focus on promoting their companies, we will focus on promoting Think-Make-Happen In Wisconsin. Expanding a student’s thinking, and advancing ideas for the future they didn’t know existed. That’s Think-Make-Happen in action. By partnering with Waunakee High School, we are communicating how apprenticeship programs deliver experience, ideas, and credits that students can apply to any path they choose: university, technical colleges, and life itself. Spread the word. THINK·MAKE·HAPPEN In Wisconsin can help support your business and talent marketing efforts. Below are some resources to get you started. We will get back to you as soon as possible regarding your request. 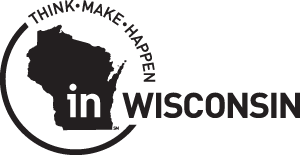 Want to learn more about Think-Make-Happen In Wisconsin, or how it can be a powerful messaging platform for your brand? Drop us a line.